If you read my previous post about the best squirrel proof bird feeders you will know that a great way to attract birds to your garden is to put food out for them in feeders. Birds, or nature’s alarm clock as I like to think of them, are one of the most beautiful sights and sounds that you can have in your garden. In my opinion, one of the most beautifully colored and unique birds is the Cardinal. 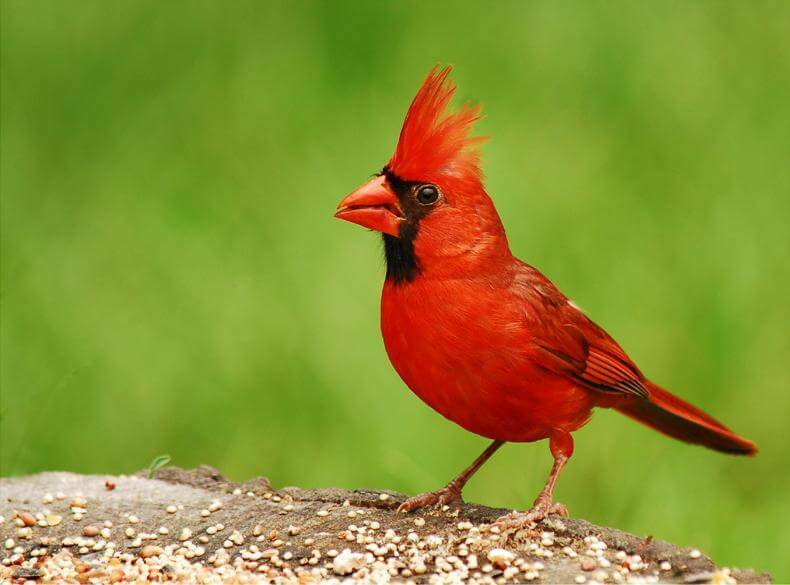 The Cardinal bird (Latin name the Cardinalis Cardinalis) has a really deep and vibrant color and is an amazing bird to try and attract to your garden because it is so different from other birds due to the unusual way it moves and flies. Choosing the right type of food and the right bird feeder can help attract more of these beautiful birds to your garden. Consider the following points when using cardinal bird feeders. Cardinals by nature are a very territorial bird and prefer to feed in more of a closed space, where they can defend themselves from predators if need be, they are also ground feeders. They are usually the first bird to eat in the morning, and the last to eat at night, so do not expect to be seeing them feeding much during the day. Of course, one of the main reasons for attracting any bird to your garden is so you can see it. However, if you put a Cardinal bird feeder in an open space then you will lower your chances of attracting any Cardinals to it at all. Instead try to put the feeder near some hedges or shrubs, this way the Cardinal will feel safer in this more enclosed territory as the bushes will provide them shelter if they feel threatened. Whereas some birds are pretty brazen and will fly right up to the feeder and land to eat, chances are Cardinals will take some time, carefully eyeing up the food from the safety and security of the surrounding bushes. Like any animals, Cardinals know what they like to eat, and by filling your feeder with the right mixture of bird food will increase the chances of them visiting and feeding. Cardinals also love to eat insects like butterflies, beetles and grasshoppers. See our detailed guide on Cardinal birds’ favorite food! As I mentioned Cardinals are very territorial and in fact pretty shy birds. Make sure that you choose the right feeder to attract them. 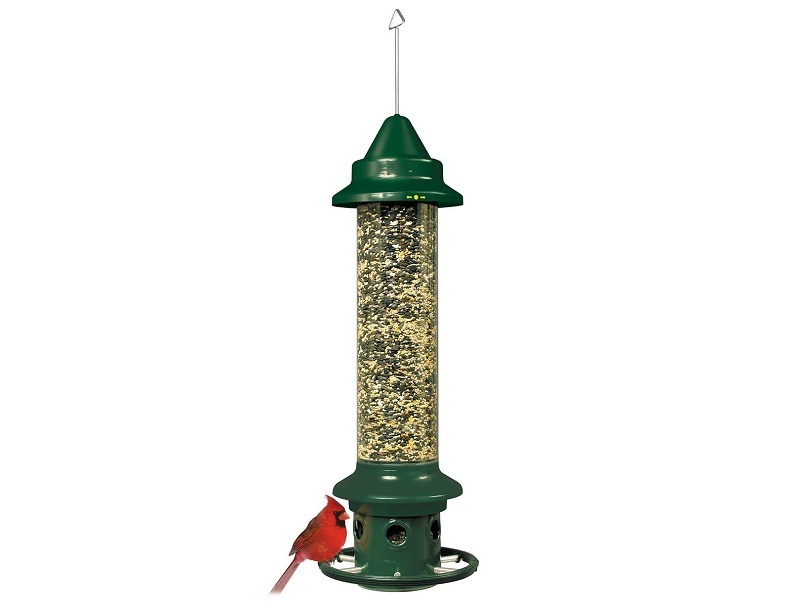 Some of the best cardinal bird feeders you can buy are the following. A really strong and durable feeder, the No/No in the name stands for No plastic No wood. As you can probably guess, this feeder is made from neither of them. It is made from metal which many people consider to be the best material for bird feeders due to how well it lasts, and how easy it is to clean, it also prevents predators (like squirrels) being able to chew through it. The No/No holds a whopping 2.5 pounds of bird seed so you don’t have to be constantly refilling it with new food. The best thing for this Cardinal specific feeder is the really wide base, which is probably large enough for 15 or so birds at a time (imagine how amazing it would be if you could attract that many Cardinals to your garden!). It also allows for perching or hanging birds to feed due to the way it is made. 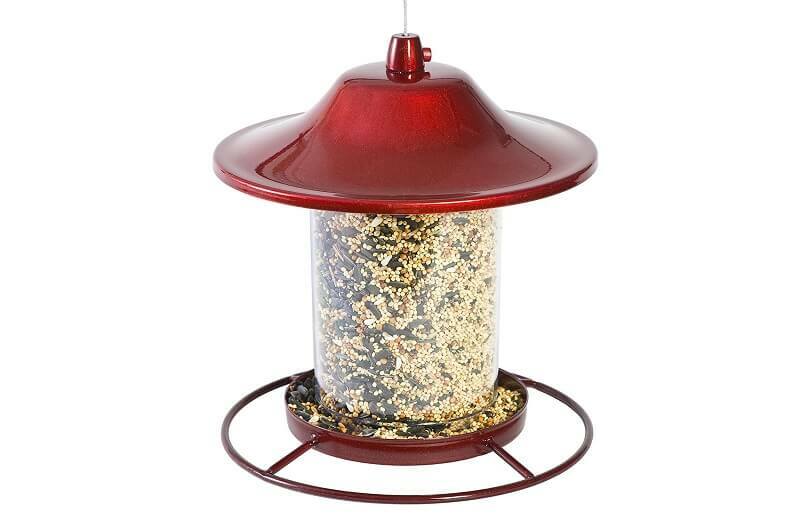 Probably one of the best cardinal bird feeders you can buy for smaller seeds and feed. An ideal tray style feeder which can accommodate larger feed like peanuts, and due to how well it is made can hold a lot of birds on the outer ring. Again, a great feeder for more than just Cardinals and the fact that you can have larger food and nuts in there, makes it a great addition to your garden. This feeder made it on to our list of best squirrel proof feeders and is probably one of the best ll round feeders that you can buy. A great feature of the Brome feeder is the fact that you can adjust the settings for birds of different sizes so you can attract all sorts of feather friends to your outdoor area, simply by twisting the top. I have this in my garden close to the floor and with the settings on wide to attract Cardinals and they are slowly but surely using it. Another selling point about this feeder is how easy it is to clean, I put mine in the dishwasher. Probably one of my personal favorite feeders, because it allows you to see birds really clearly due to the fact it is see through. The Crystal Clear feeder is a very simple and basic feeder, which has suction cups so you can attach it to windows. I have mine stuck to the bottom pane of glass on my patio door, which is close to some bushes. The only drawback to this particular feeder is the fact that it is pretty open to predators, and it is also open to the elements, so when it rains hard the feed does get wet, that being said it is worth it if you have somewhere to put it just because of how visible the birds are when feeding. I tend not to put too much feed in at one time just to make sure I can save money. It is also super simple to clean. 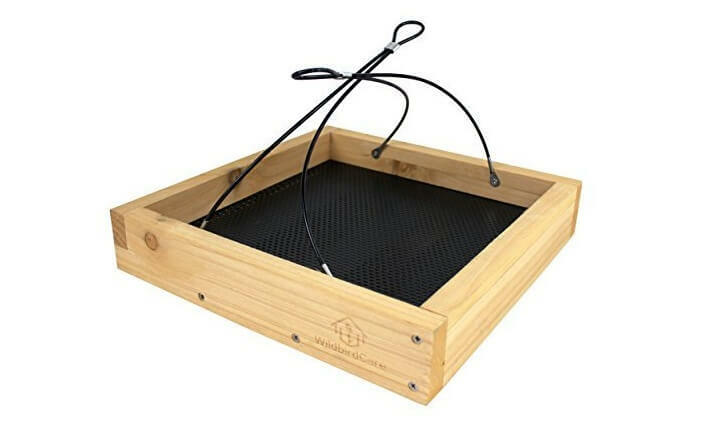 A really nice wooden feeding tray that definitely allows great access to all birds, the durable hangers and base will ensure that this feeder stays put and lasts a long time. Another simple feeder to clean, the bottom tray simply slides out for washing. Like with the Crystal Clear feeder, I tend not to put too much feed in at one time, because the Care Platform feeder is totally open to the elements and predators. However, I do have a couple of these in my garden purely because they offer great views of the birds feeding, and they are super easy for Cardinals to use and eat from. This feeder is both good and bad (well you may think so). 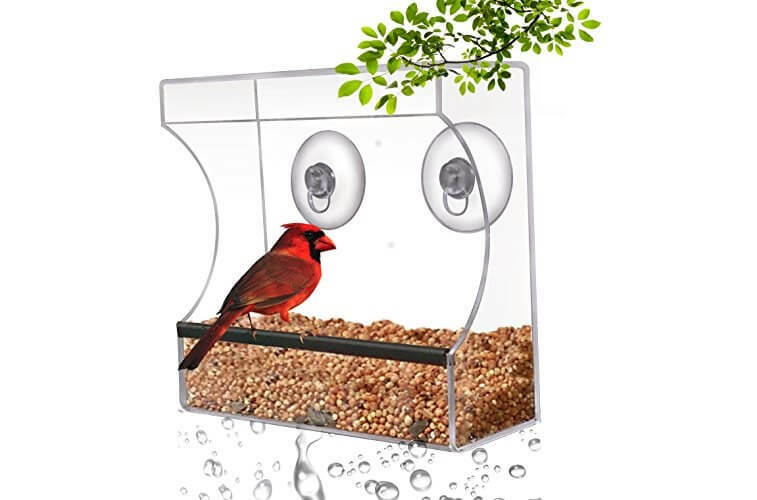 Firstly the good points, this feeder is amazing to attract and coax Cardinals from bushes and holds a nice amount of peanuts (or any larger seed and feed you wish to use). However, the bad points are it also attracts squirrels. 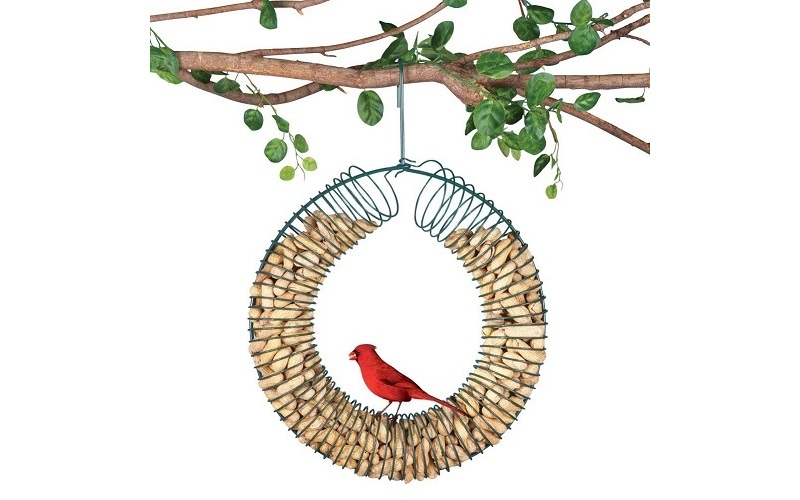 Now for me, I have enough squirrel proof bird feeders to have a few of these wreaths dotted around to try to tempt Cardinals from the bushes (or if not at least they can feed in the bush from these). However, you have to think if you want to run the risk of attracting squirrels and other predators to your garden. Of course, you want to see the birds. However, areas of the garden where you spend a lot of the time or other people spend is not an ideal place to put a feeder or attract them too. Put the bird feeders at different levels closer to the ground (remembering to place them near hedges or shrubs so they have cover). 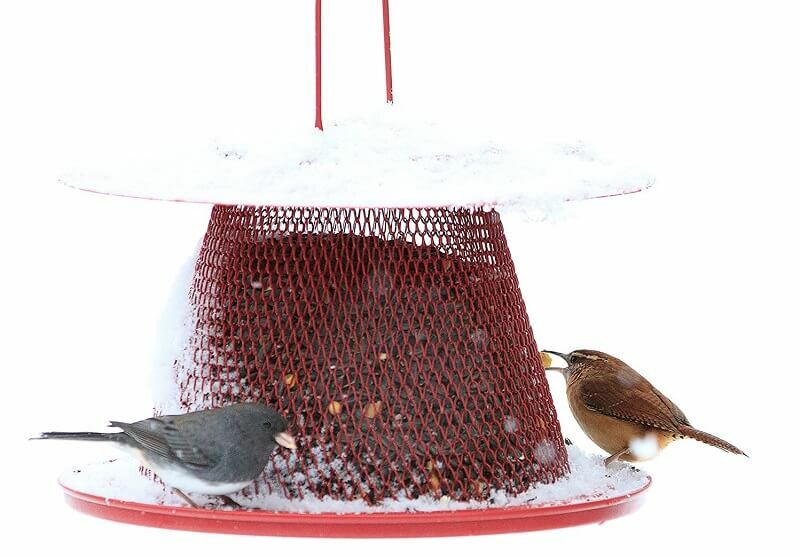 Put different types of food in the feeders to see what attracts them more. If the Cardinals are in the shrubs or bushes but are not going to the feeders try scattering some food on the floor underneath the feeders to coax them out. Gradually make the area in which you scatter the feed smaller so hopefully, they will eventually eat at the feeder. Once they are comfortable with eating at feeders in your garden and making sure that you feed them consistently, they will keep coming back. To attract Cardinals to your garden definitely does take time and patience and more effort than attracting more conventional and common birds, however the joy that they bring with their bright color is more than worth it. Do you get Cardinals in your garden? What food do you find works the best? Yeah, that can be quite problematic. Metal poles can help with predators such as squirrels and raccoons, while a feeder with a wire cage around it can help prevent large birds from taking the birdseed. Maybe that kind of feeder would help in your situation. I have found that the squirrels don’t like safflower and the cardinals do. I also get chickadees, finches, titmice, nut hatches. I use safflower seed as well and all of my SC birds seem to love it! Thankfully, the squirrels don’t. Now if I could just discourage the chipmunks! I live in the NE (Ohio) and the squirrels in my yard love safflower. I put out a mix of safflower and chipped sunflower hoping to deter squirrels and predator birds but the piggy squirrels eat everything. The best remedy are the hawks! I would like to fine a feeder that doesn’t let the grackles and blackbirds feed at my feeder. They chase the cardinals away and eat all the food. Is there a covered feeder the cardinals and the other small birds can feed at and not the other big ones? Will cardinals fly through some of those that have open wire type feeders? Hi, you can try using a metal mesh or tube bird feeder to repel Grackles and other unwanted large birds. Also, you can try offering the seed that Cardinals love but Grackles, Crows and Blackbirds generally avoid such as Safflower seed. Hi. I replaced the perches on my tube feeder with springs from some plate hangers. I replaced the metal perches with small bbq skewers cut to extend about 1/4″ then fitted approx. 2″ lengths of spring. To secure the new perches, I did drill into the feeder where the perches fit and secured with clear gorilla glue. The “new” perches support the weight of cardinals (1.5 oz) and smaller birds but will bend with heavier birds such as blue jays, etc. So far, so good. Today I counted 6 pairs of cardinals at the same time. That’s a great idea! Such a creative way to repel heavier birds 🙂 It must’ve been nice seeing so many cardinals at once.